I inherited my dad抯 � JD 110 (Kohler 181 8 HP) and I am having a hard time figuring out what battery I should put in it ? The manual says 12 V 24 amps. I抳e gone to Napa and they were unable to match it, AutoZone started talking about the number of cranking amps and there抯 a wide range, Advanced just looked at me like I was high. Can anyone out there tell me the number of cranking amps I need for this tractor and any recommendations on the best battery . I抦 dying to see if this thing starts. Hope this could help. Have a good day. 350 cca and this bad boy turns over and fires. I used starter fluid (no gas in tank). Smoked like crazy but I did add oil to the sparkle hole. Going to roll it outside Friday and put a shot of gas in her and see what happens! What I have found. Go to tractor supply and look at the garden tractor batteries. I bought the biggest CCA one that is made for my Husqvarna garden tractor. The same battery will also start my CUB Tractor. Their web site is showing a 340 but I think mine is a 350 or something. Not that much more in price. Will spin anything over and it still fits. This seems to make sense? I just did not want to get something over-kill, but common sense says the battery can only be so big (10x6) is about the max. If yours has standard automotive battery cable ends, looks like a 500 cranking Amps BCI 22F series battery is what DEERE shows in the Parts Catalog. Parts book also shows a bolt/tab terminal option. Post back if yours has that style of connections. Bolt/Tab, but I am going to go with a 350 or so cranking amp battery . You抮e suggesting 500 and there抯 just no way that would make sense ? Unless I抦 not reading something correctly??? You did not mention in your first post that yours had a "garden tractor battery" with "L-shaped posts" as the 8 HP Kohler engine version apparently left the factory with. 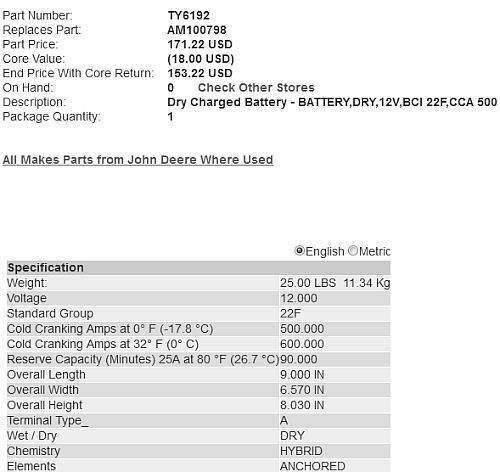 The part number shown for your version is NLA from John Deere, so the "specs" no longer come up for that version. The single-cylinder Kohler engines (even with ACR) take a bit of juice to get past compression and crank well, so get a "garden tractor-style battery" with the highest cranking Amps that's readily available to you. As a point of reference, I have a garden tractor with a 12 HP Kohler and the largest "garden tractor-style" battery stocked locally when I needed one last year was a 420 cranking Amp, and it's none to big for the 12 HP. Thank you Bob. For clarification gives me the reassurance as to what I am looking for ! I want to see the thing crank up and blow smoke!!! I am already for sure that it needs new rings I just have to see it for myself ! Anvil, if you don't already have it, you can download an official service manual for your engine for FREE (in.pdf format) at the link below. I don抰!!! Thank you. This is going to be really useful as I suspect I will be venturing into the engine block to redo the rings . Bob, any suggestions in regards to redoing the rings .... are there other things I should definitely take care of while I have the engine open . Based on my limited understanding it appears to just be a bad rings.